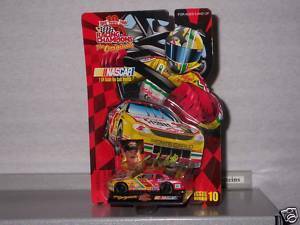 1999 Racing Champions 10 years Terry Labonte Kellogg's Corn Flakes #5 1/64 Scale Car Limited Edition 1 of 19,999, Serial #00979 "PRESS PASS" Card Condition: New (in original package), see picture Policies; 1) Buyer will pay shipping charges (delivery confirmation included) (shipping to lower 48 states ). All cars are shipped in a box (not in envelope). 2) If you are purchasing more than one 1:64 scale NASCAR, Hot Wheels, Matchbox, Shelby, Jada, Johnny Lightning or PIXAR CARS listing at same time you can save on shipping. All items to be paid at same time and items will be shipped in same box. SPECIAL SHIPPING DISCOUNT: 1 to 2 Cars 4.95, 3 to 5 Cars 5.95, 6 to 12 Cars 8.95. 3) Payment by PayPal. Payment is required within 7 days of purchase or sale ending. Powered by Turbo Lister The free listing tool. List your items fast and easy and manage your active items.